There’s something so frustrating about waiting in a doctor’s office. You’re usually in a tiny waiting area with a bunch of strangers around you and you’re just not quite sure what’s wrong with them. It makes the whole situation uncomfortable as you’re trying to avoid catching the next person’s bug while you’re there to get help with your own concerns. I’ve never been to a doctor’s office without a pretty long wait (20 minutes or more). It has me rethinking everything about the way I seek out my medical care. 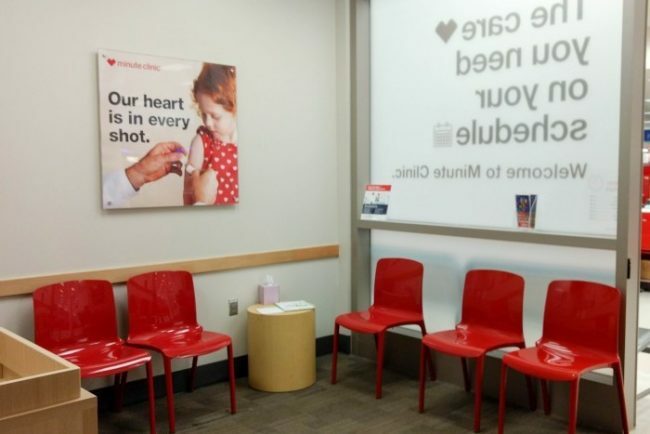 I’ve partnered with CVS to give my local MinuteClinic a try. I was really impressed by the convenience to be able to shop and browse while waiting in the queue and extended hours that are more convenient. Our appointment was fast, the practitioner was friendly and helpful, and we were quickly on our way. 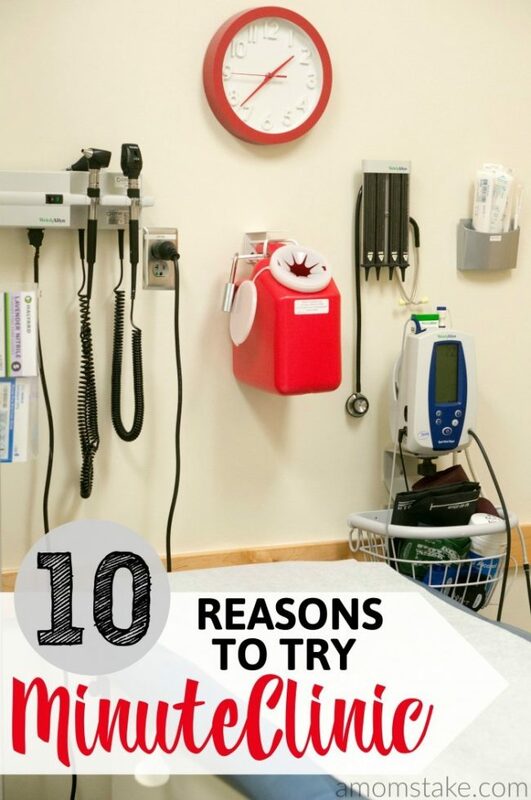 Here are 10 reasons why you should consider CVS MinuteClinic next time you have a non-urgent need. 1. Short wait without a crowded waiting room – My favorite reason – skipping the wait! You can check-in online and it will tell you approximately how long until the clinic will be ready for you. Then, just head in for your arrival time and you’ll have hardly any wait at all! 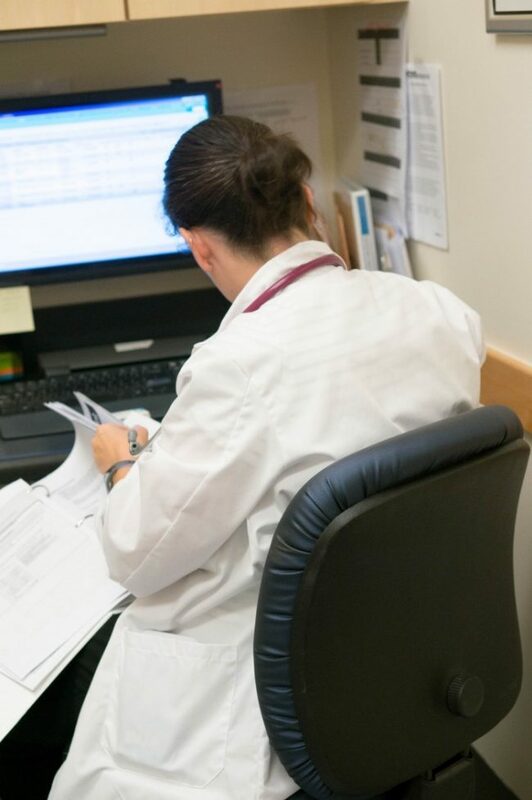 You’ll be able to see an estimated wait time even if you’re a walk-in patient, before checking in, so you can plan accordingly instead of waiting in the waiting room. 2. Fast and easy appointments – Our appointment was quick and to the point. The practitioner went through insurance and a few quick registration questions to make sure she had all the information she would need to process a claim and give my son his next needed vaccinations. There was no awkward moment at the check-out desk of the doctor’s office to make a follow-up appointment or wait for them to dismiss you. 3. Convenient locations – There are four CVS MinuteClinic locations within 10 miles of my home. Most of the locations are right by all the stores and shopping I regularly do, meaning I don’t have to make a special trip or go out of my way just for a visit. I can pop in to a local MinuteClinic when I’m near by and get the help from a knowledgeable practitioner. 4. Flexible hours to work with your schedule – My local MinuteClinic has hours from 9am to 7:30pm on the weekdays at the location inside of Target and 8:30am to 7:30pm at CVS Pharmacy. That means you can sneak in a visit before work or after work or have your kids seen after school hours instead of disrupting your day for a doctor’s visit. 5. Make your appointment online or through the app – It’s really quick, and convenient, to make an appointment or hold your place in the queue. 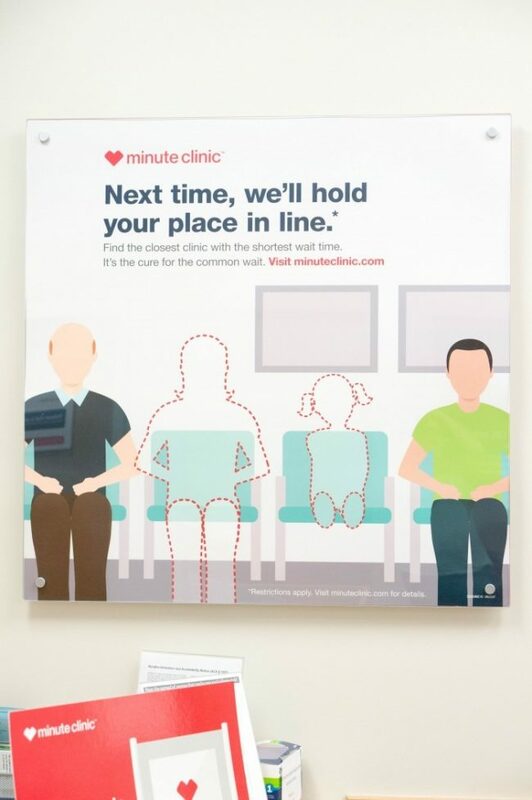 You can make an appointment at cvs.com/minuteclinic or through their app. By taking that first step, you’ll be able to get alerts when the clinic is ready for you and save you nearly all the wait time! 6. No appointment necessary – Speaking of making appointments, you actually don’t need one at all to be seen. Walk-ins are accepted and you’ll be able to see right up front before deciding what your estimated wait time will be. Check-in, then browse the store while you wait. 7. 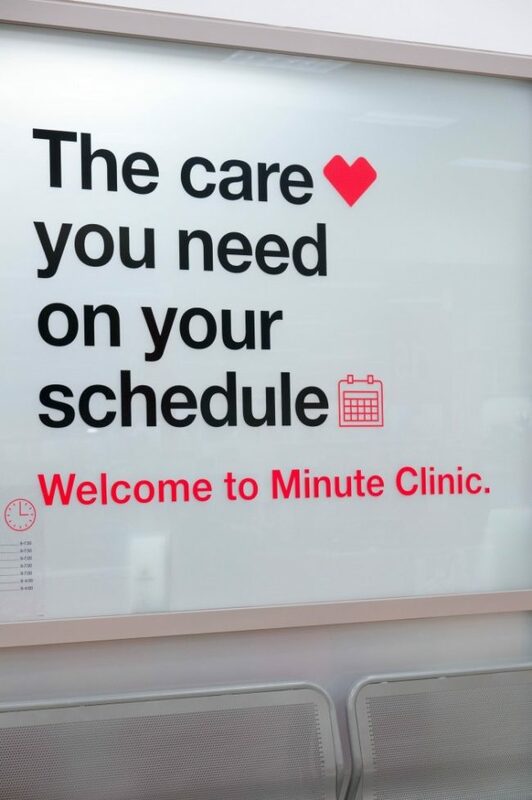 Get a quick checkup where you shop – You don’t have to go out of the way with MinuteClinic. You can tend to both your regular errands and a health check-up all at the same location. I’m all for taking care of two tasks from my to-do list in one stop. 8. Accepts most insurance plans – You can check your if the MinuteClinic is covered through your insurance plan using their Insurance Checker tool. You’ll know right away if your plan covers the services available. 9. Affordable for cash-pay patients – You can find all of MinuteClinic’s pricing through their straight-forward and upfront pricing model. If you don’t have insurance coverage or have a high deductible you want to avoid, you can still be seen by a practitioner at the MinuteClinic and know exactly what your costs will be before you get started. 10. Helpful, friendly, and knowledgeable practitioners – I appreciated the 1-on-1 care from the practitioner. Instead of getting passed back and forth between a nurse and a doctor, the entire visit was handled by one individual making it the visit more meaningful with the personalized attention we received. What would be your top reason to give your local CVS MinuteClinic a try? Playing the waiting game at a busy clinic with a sick child can be so awful. It can actually be worse if you have one child that ISN’T sick and have to drag them along too! This sounds as though it would be a great way to avoid all that fuss. I wonder if there are any available in my area. CVS MinuteClinic sounds like such a great service. It looks like the wait times are pretty decent and I love the convenience. I hate waiting on the queue just for a 20 minute check up.. i hope minute clinic expands, i hope theres one near my location. 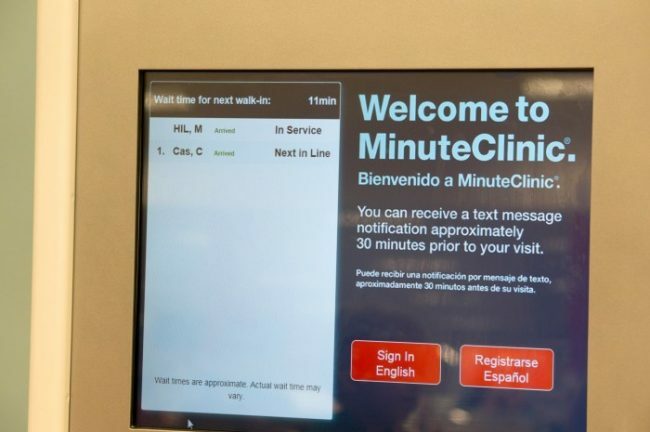 I still haven’t tried the MinuteClinic and I can’t even imagine how much time I’ve wasted. It’ll be perfect when I need to get everyone ready to stay healthy through cold and flu season. So cool, I had no clue you could use CVS as a MinuteClinic. This is so handy and totally love the idea. So wonderful that you can get attention right away and get some help at odd hours. I like being able to get flu shots. My mom swears by the minute clinic. I need to give it a try! Sometimes we have to wait over a week to get in to see our Doctor. Next time I will have to check out the CVS MinuteClinic . If our doctor’s office was closed or booked I would totally head to Minute Clinic. What a great service for people. I think these clinics are great. I wish we had a CVS nearby. I would definitely go there if one were closer. I love CVS Minutes Clinics and have used them a fair amounts of time! Especially when I used to teach adn needed to get in and out quick! Those peseky germs in the classroom got me everytime! We love the MinuteClnic! It is so convenient and there is hardly ever a wait. Much better than the doctor’s office! I like to use them in a hurry. No need for long waits and CVS is EVERYWHERE so you can always find a location. This is awesome, I had no idea CVS offered this! I absolutely hate waiting at the doctor’s office while everyone is coughing around us. I hate waiting! These are all great reasons to visit. We always use them for our back to school physicals because it’s faster than scheduling an appointment with the doctor! I had an incident with a fake christmas tree last year and went to one of these Minute Clinics- ended up with a tetanus shot. It was relatively quick and painless, I’d definitely recommend it! We have used the minute clinic many many times. They are so convenient and easy that I use it more often than our regular doctor. This sounds like an outstanding options for healthcare! I love that it makes things so easy for me. With my schedule, easy is key! 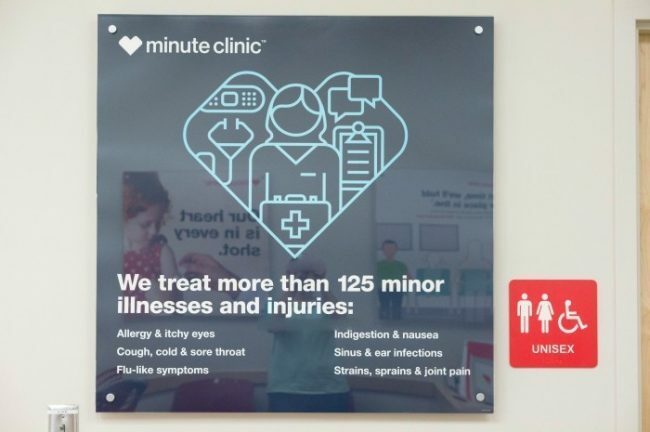 MinuteClinic is the best! We recently started going there, and it’s such a time saver. I love being able to go there for common medical issues instead of having to wait at the doctor’s office. I had no idea about these clinics. I don’t like waiting in a doctors office. I’m going to check to see if any are available in my area.